In the future, Microsoft apparently believes, people may simply twitch their fingers or arms to control a computer, game console or mobile device, ReadWriteWeb reports. Microsoft applied for a patent on electromyography (EMG) controlled computing on Thursday, suggesting that a future smart wristwatch or armband might simply detect a user’s muscle movements and interpret them as gestures or commands. The “Wearable Electromyography-Based Controller” could also use a network of small sensors attached to the body, all communicating wirelessly with a central hub. Microsoft also showed off a prototype of an EMG controller in 2010, and has filed complementary EMG controller patents as well as a patent covering the gestures used to control them. But EMG-based computing does imply several interesting possibilities: the ability to type without a keyboard; wiggling a finger, rather than an arm, to provide fine-grained Kinect controls; or new ways to control “waldos” and other robotic appendages. 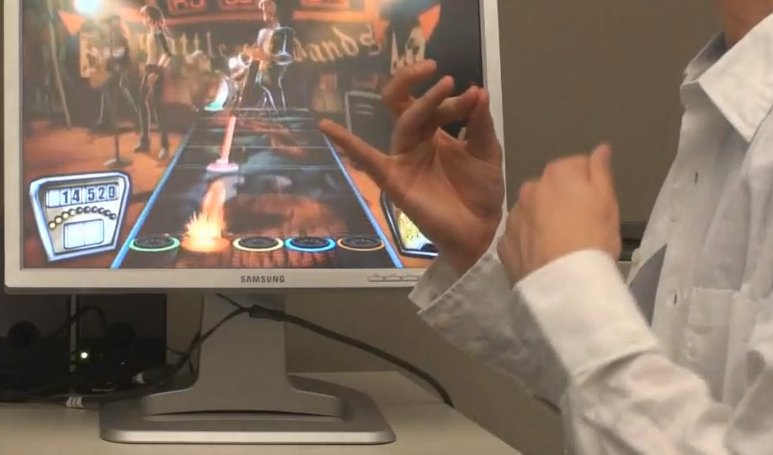 Microsoft even suggests that a glove-based version of the EMG controller might be used to automatically translate American Sign Language into written or spoken English or other languages. That’s pretty cool.